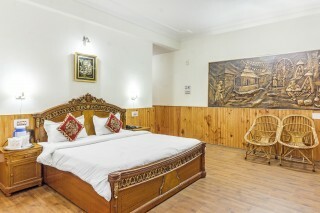 This is an offering of a private room in a well-furnished boutique stay, located close to the famous Evergreen Café. The room on offer can accommodate up to four people and is ideal for a small group stay. The property also features an in-house restaurant and offers delightful views of the surroundings. The establishment is located right by the road and is dotted with potted plants. Displaying a flagstone exterior with wooden railings, the boutique stay also has ample parking space for convenience. The lobby boasts chequered-tile flooring and is furnished with plush sofas for convenience. It has pretty chandeliers which brighten up the space and huge windows which provide great views. An LCD TV ensures that you remain up to date with your favourite shows. The in-house restaurant is an added convenience for people who like hassle free food service. 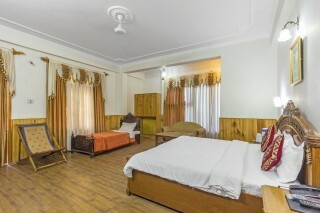 The bedroom on offer is spacious and handsomely furnished to ensure that the guests have a delightful stay. 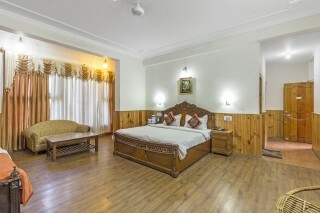 It boasts laminated wood flooring and partial wood-panelled walls adding a rustic touch to the accommodation. 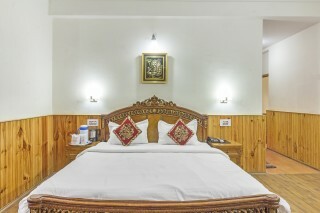 Furnished with a plush intricately carved double bed and a comfy single bed, the room can comfortably accommodate four people. Overhead wall-mounted lamps ensure that you can read well into the night without inconvenience. A plush two-seater with a coffee table, a compact storage unit, a dressing table, and a couple of cane chairs are also present for comfort. A wall is adorned with an elaborate art piece which blends perfectly with the decor. The windows are draped with scallop curtains and filter daylight and maintain adequate ventilation. The well-tiled en suite bathroom is appointed with western sanitary ware. Kasol is famous for not only its beauty but also for adventures sports. 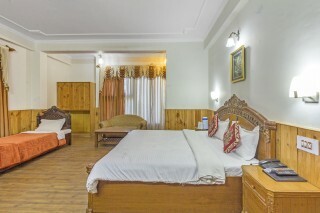 Trekking and river rafting can be organized by the boutique property staff on request. At the same time you may take a tour to artistic destinations . 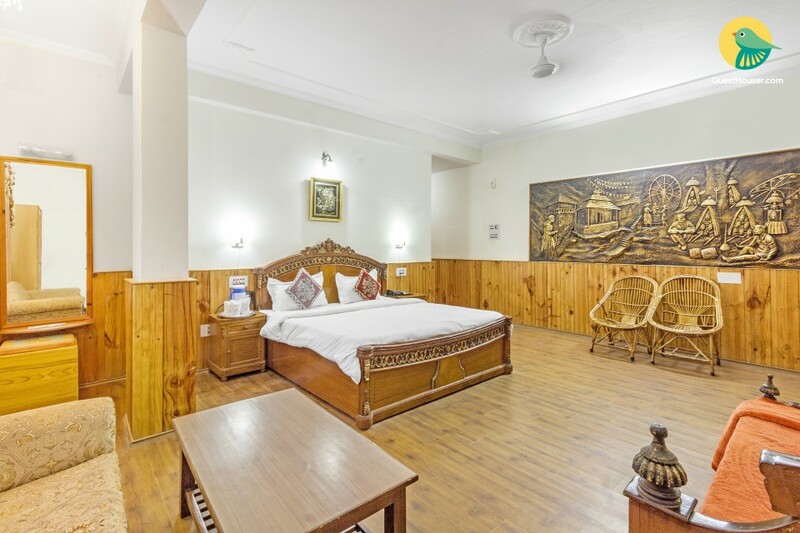 The very attractive tourist sites include tosh Village, Malana, Parvati Valley, Manikaran Gurudwara, Kheer Ganga and Shani dev Mandir.Manikaran faces harsh weather conditions in winters and cooler nights in summer. Good place for a family stay. Pathankot is the nearest railway track which is nearly 150 kms away. Chandigarh railway station can also be reached by travelling 310 kms. The nearest airport at bhuntar is nearly 45 kms away. 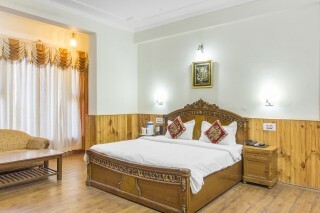 Private taxis travel to and fro from manikaran to airport. From Manikaran buses travel to Kullu (45 kms distant), Manali (85 kms distant) and Chandigarh (278 kms distant).